You have 1033 characters. Don’t forget to add important and relevant keywords in your description to improve your iTunes app page and optimize your SEO. Your app's last version was released on December 18, 2011. It is important to regularly update your app. Best practices recommend to update your app every 4 to 6 weeks. This means fixing reported bugs, improving existing features, launching new features etc. Keep an eye on users' feedback. The next great features may already be asked by many users. LARGE, crisp display increases visibility at a distance. 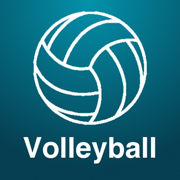 Keep score of your volleyball (or badminton) game on the iPad. Simple touch controls allow you to add/remove points simply by touching the score you want to change. Touching the top 2/3 of the number will add to the score, touching the bottom 1/3 will subtract. Touch away from numbers to bring up the menu to reset scores and connect remote. More options coming soon, please leave me a comment if you have a specific feature and I'll work on getting those to work first. Serve arrow changes automatically when team gets point. NOTE: App was designed for the iPad. The iPhone and iPod Touch functionality added to use as a remote control, however, the app works perfectly on its own on all three devices.